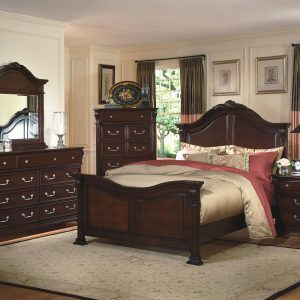 Camelot Distressed Storage Bedroom Set. 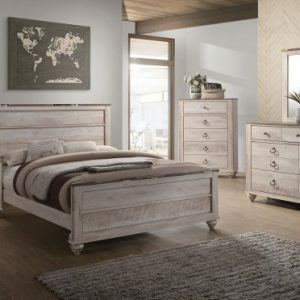 This Distressed storage bedroom set is sure to add finesse to any home with it’s unique distressed finish. The deep oversized drawers offer exceptional amounts of space. Full extension drawer glides and fully finished drawers that include felt lined drawer tops and dust proofing in bottom drawers for all case pieces. Bevelled glass mirror. Storage drawers in bed. 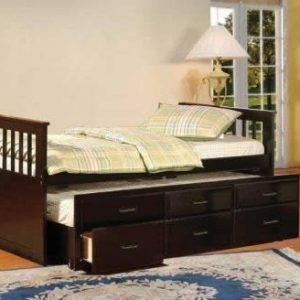 When creating distressed bedroom furniture, it is a good idea to stick with colors which are suitable for the style of the furniture so that it looks naturally, rather than artificially, distressed. 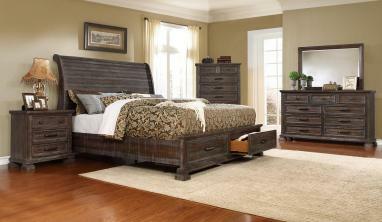 Other types of distressed bedroom furniture may feature actually worn and distressed wood but in a new item. For instance, old barn wood from disassembled barns is often used to construct new furniture. This gives items a worn appearance but with the stability of real wood furniture. There are varying degrees to the distressed look a piece may have. Some items have a slightly faded appearance on the outer edges of the wood or metal exterior, while others may feature cracking paint, worn wood, scratches, uneven paint or finish markings and other imperfections. In distressed bedroom furniture, these marks are usually there intentionally.